Donations can be made securely online using your VISA, MC, AMEX or DISCOVER card. You can make a one-time donation in the amount of your choice, or even set yourself up to make recurring monthly donations to support our cause. Whatever amount you can donate will help an animal in need, and we thank you for caring! We are operating at full capacity and are in desperate need of monetary and canned cat food donations. After veterinary care and medical supplies, cat food and kitty litter make up our 3rd largest expense. The Killingly Public Library and Norwichtown Veterinary Hospital have graciously agreed to accept donations for Passion 4 Paws on an on-going basis. Passion 4 Paws no longer uses any clay or scoopable cat litter. In an effort to provide a healthy, non-toxic environment for our volunteers and animals, Passion 4 Paws now exclusively uses World's Best Cat Litter or Feline Pine. Both of these brands of of litter are available at Tractor Supply, Petco, and other specialty pet stores. For more information on the potential health-risks (to humans and animals) regarding the use of clay cat litter, please visit our RESOURCES Page. Passion 4 Paws has created a WISH LIST for Kuranda Cat Towers. Our old, carpeted cat trees had to be thrown away, because they became too difficult to keep clean. These easy-to-clean Kuranda Cat Towers can be used both inside our shelter and outside in our screened cat enclosure. 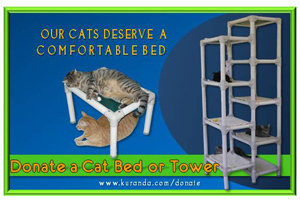 To donate a Kuranda Cat Tower click here.